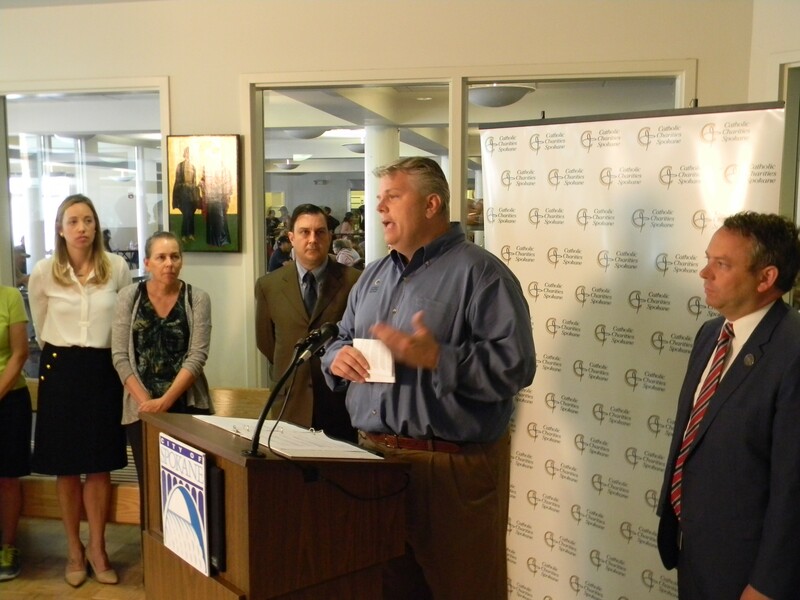 Rob McCann (center), Catholic Charities executive director, joined Council President Ben Stuckart (left), Mayor David Condon (right) and others to announce a new effort to keep the House of Charity open 24/7. The House of Charity, Spokane’s largest drop-in center and shelter for the homeless, will be open 24-7 as soon as next year. Earlier today, city leaders gathered in the chapel connected to the shelter, which provides meals and connects clients with services, to unveil a partnership that’ll pool together enough resources to keep House of Charity staffed and open around the clock. In January, Catholic Charities, a large social services nonprofit, cut the hours at the House of Charity and just weeks ago indicated that more cuts would be on the way if it didn’t quickly fill a hole in its budget. Last week, Bishop Thomas Daly of the Spokane Diocese told the Spokesman-Review that if the shelter hadn’t cut its hours Mike Kurtz, a homeless man, likely would have been safe inside and not have been in a confrontation with police that left him dead. But that could all be changing. The city will be contributing $200,000 from an emergency fund towards the $500,000 needed to keep the shelter open for the rest of the year. Spokane Mayor David Condon and Council President Ben Stuckart announced a partnership that includes the Downtown Spokane Partnership, as well as social service nonprofits Catholic Charities, Family Promise, Salvation Army, Volunteers of America, Transitions and YWCA to address homelessness, specifically the lack of a 24-7 shelter. Currently, the House of Charity is open from 7:30 am to noon and serves lunch to anywhere between 200 to 400 people daily. It reopens at 6:30 pm for men looking for a place to stay overnight. But the details are still being worked out. McCann said it could cost $600,000 to keep the shelter open 24/7. In the meantime, Stuckart said there's still a funding gap. "[W]e are going to need more partners," he said.